Finding good brick-and-mortar pet supply stores of both the small independent and big-box discount variety is easy to do in my sector. I live in Chicago, about five minutes from two large chain stores and about fifteen minutes from an all natural pet food store. 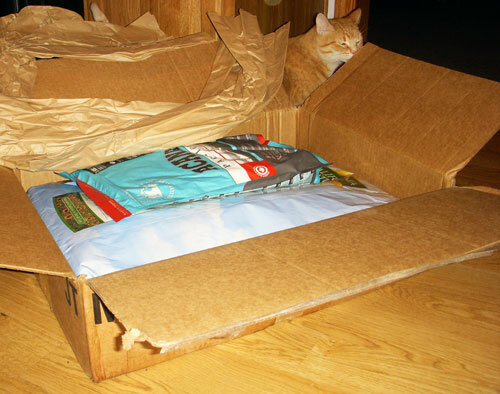 Could I still benefit by using an online pet food retailer? I got a chance to try it out last month over the Presidents Day holiday with a simulated “emergency” food order. Freya was about to hit bottom on a bag of California Natural Lamb Meal & Rice Large Bites. If you are a repeat visitor, you might recall that Freya has a mild case of IBS and it is one of a very few foods that agrees with her. Happily, it is also one of the more than 70 brands of food currently carried by Mr. Chewy — an excellent variety, with an emphasis on premium and natural foods. Mr. Chewy’s selection of California Natural varieties is actually better than what is available locally. I have had a hard time finding the low calorie and grain free varieties at times. Mr. Chewy also carries Axel’s favorite food choices: Wellness CORE and Orijen 6 Fish. I had been wanting to try Acana Pacifica as a substitute for the Orijen 6 Fish since it is slightly less expensive, but it wasn’t widely available locally. Since it was in stock at Mr. Chewy, I placed our order for a large bag of California Natural and a small bag of Pacifica. The shopping experience on this well-organized, easy to navigate website was pleasant with no surprises. Out of stock items were clearly marked as such and the toll-free number and live chat link were displayed on every page if I did have a question. One of the most attractive benefits of Mr. Chewy is their free 1-2 day shipping for orders over $49. 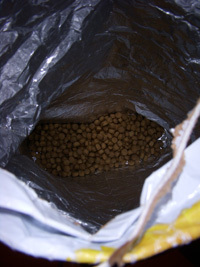 This is a huge deal for heavy items like the large bags of dog food. I had previously used another online pet food retailer to send food to Axel when he was on the road with Julia chasing his AKC Championship. While service and selection were satisfactory, the expensive shipping charges were not pretty. So it is wonderful to see Mr. Chewy offering both the free shipping option for orders over $49 and a $4.95 flat rate for smaller orders. So. Would the food arrive as promised before Freya hit the bottom of the bag? Yes, it did! The order was placed on Monday afternoon and arrived on Wednesday afternoon as promised. It was raining that day, and no one was home when the package arrived. Not to worry, as it was packaged nicely and our FedEx driver doesn’t throw our boxes over our fence. Oliver Kittyweiler looks a bit offended that no cat food or cat treats were included in our order. Maybe next time! I did a quick check of local pricing of our most-purchased items. Base prices average about a dollar more at Mr. Chewy than at my usual local stores. However, sales taxes in Cook County and Chicago are among the highest in the country, as are gasoline prices, so the total cost from Mr. Chewy ends up the same or less than a local purchase. In addition to dog food, Mr. Chewy carries a good selection of cat food, dog and cat treats, dog potty pads, cat litter, and flea and tick treatments. There is a further discount to their already-competitive pricing if you set up subscription ordering. If that isn’t enough to get you interested, Mr. Chewy also has a referral program that benefits not only shoppers, but animal-related charities as well. If you try Mr. Chewy, enter my referral code KWIL7576 when you check out. Mr. Chewy will give you 10% off your first order, and donate $10 to their partner pet charities. 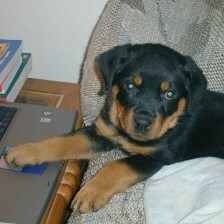 The vom Viersen Rottweilers give Mr. Chewy a big paws up! For more information or to place your first order, go to MrChewy.com or visit their Facebook page. MrChewy.com offered us a store credit to use in reviewing their service. I did not receive any other compensation for this review and am not connected to MrChewy.com other than as a satisfied customer. I thank them for the store credit and the opportunity to write this review. The first sticking point? It always comes down to measuring everything the dog eats and does. The kids might have fed X. I didn’t know the treats counted. (Seriously?) My mother-in-law sneaks her food under the table. While we of course know that treats count, we haven’t been monitoring the types and amounts of treats, as well as food used in training sessions, as closely as we should. I am sure that as I start keeping track, I will be surprised and somewhat dismayed, much as I was when I’ve kept a food diary for myself and realized how much mindless snacking happens during a typical workday. As you may recall, Freya has some weight to lose and Axel has some weight to gain. In the month since he’s been home, Axel’s put on several pounds. Once we got a good handle on the amount of energy he expends when spending part of the day in a kennel run and part as a house dog, as compared to being a full-time house dog, it was pretty easy to recalculate the amount of food he needs when living with his handler, and the smaller amount of food he needs when living at home with us. I must admit that I have not been as diligent as I should have been about getting enough additional exercise for Freya (and myself). I just found a nearby source for the low fat formulation of California Natural Lamb and Rice, which is one of the only foods that Freya can eat due to her mild IBS. I was quite relieved to find that she likes it, and that she can eat it with no tummy troubles, so that will be a help in reducing her calories and still letting her eat enough to feel full. She gets 2 to 2.5 cups per day, plus treats, so that should be fine, which agrees with our vet’s calculations. That is, unless the treats I’m using turn out to be more caloric than I thought. I’ll need to track down the information on that, which was another suggestion from the Dolittler post. It is very true that caloric information for treats is not always on the package, but often easy enough to find on the manufacturer’s websites, so it is time for me to do some research and maybe switch some treat choices. I often use “people food” for training treats, usually hot dogs or frozen meatballs, so it will be easy enough to switch to the low fat versions of those items as well. I’ll stop at the vet on the way home from training on Saturday and get a current weight for Freya, and see how we are doing so far.